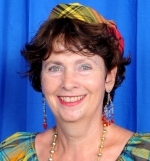 Gwen is a Canadian expatriate who has lived on Dominica, the Nature Island since the late 1990's. She relocated there from her "home and native land" in order to have improved health and a better, albeit simpler quality of life. Her educational background is in music (BMus '81 - Queen's University, Kingston Ontario) and librarianship (MLS '83 - Dalhousie University, Halifax Nova Scotia). She manages to put her skills to good use in Dominica. She sings in a small vocal ensemble that occasionally performs at charitable functions and church services. She has also taught senior English Literature courses at a local private school and English as a Second Language (ESL) classes to French adults from the islands of Guadeloupe and Martinique. While she has previously written extensively about Dominica in different media, her current focus is on her blog, Ti Domnik Tales, which highlights many of her adventures and experiences,as well as some of the fascinating people that she has met on this special island. Let’s get it straight from the get-go: I am NOT writing about the Dominican Republic, a Spanish-speaking island that forms part of Hispaniola with Haiti. Never been there. I hear that it’s lovely, though. Dominica (pronounced Do-min-EE-ka), my adopted home, is a tiny rainforest island that is located in the eastern Caribbean between the French overseas departments of Guadeloupe and Martinique. And yes, English is spoken here, along with a Creole dialect that harkens back to an earlier time and reflects the island’s diverse history. If I’ve piqued your curiosity already, then you must read The Dominica Story: A History of the Island by Lennox Honychurch (1995). It’s complex and captivating, just like the scenery! This is part of my enduring fascination with a lesser-known, hard-to-get-to Caribbean island, which became an independent republic in 1978. I’ve only become intrigued by Dominica’s history since spending so many years here and wanting to better understand the background of the place that I’ve called home for almost two decades. My reasons for choosing this relatively unfamiliar tropical destination arose from chronic health concerns and a desire for an improved quality of life. Severe environmental health challenges posed significant problems for me, even after years of desensitization treatments for multiple allergens and chemicals as well as intensive chelation therapy for multiple heavy metal poisoning. I did live in an eco-house and followed strict environmental health protocols, including avoidance of all offending agents. But it was always an effort to find truly clean air, food and water and to be able to move about freely without trying to dodge the ubiquitous contaminants found in developed countries. Long story short – I did lots of research and went on a fact-finding mission in the Caribbean in 1997. While I did check out a number of islands, it wasn’t until I arrived on Dominica that I began to feel better – almost immediately! Mind you, I didn’t just come here and stay – I was cautious in my approach to an unfamiliar setting and I tested it out for about a year and a half by travelling back and forth until I decided that I could actually live in this developing country, which has its own challenges – but at least I could have some of my health back! Many years later, I can confidently claim that my experiment has been for the most part, a success. After all, I am still here! With a population of about 70,000, this mountainous country of 750 square kilometers (290 square miles) is said to be a little smaller than New York City – without millions of people, tons of pollution and a massive concrete jungle! On the Nature Island, an escape to a real tropical retreat is only a short drive inland from any seaside point, such as Roseau, the charming little capital city. Although it can be congested and stifling on a hot day, some enduring architectural features of the tropical Victorian era still prevail and are certainly worth some passing admiration. One of my favorite focal points in the bustling little city, where huge cruise ships can moor right alongside the Bayfront, is the Saturday Morning Produce Market. On this lush fertile island, fruits and vegetables abound and their varieties are seemingly endless! It’s relatively easy to find organic sources too – my favorite is Roots Farm, which is managed by an American/Dominican couple: Karen and Roy. Hello! thank you for creating such an interesting report of life on this island. Can i ask you if you might know what it might take for a couple to live there on retirement income? We speak french somewhat as my mother is french so i think this could be a good choice as to where to live. Also i love organic for many reasons. I would love to know more if there is a site to go to. Anyway thank you for all that info. Sounds very nice. Can you drink the water safely? Also, is there a crime problem? I had the rare privelige of working in Dominca for 3 weeks and it was there I finally understood the concept of losing one’s heart to a place. Dominica is superlative. When God finished creating the world he had a bucket full of scenery left over and He just upended it over Dominica. And to live in this wonderland He created the most wonderful people. It is my fervent wish to return there one day. I am sick of Chicago. The arctic winds. Snow piled knee high. Traffic. Shootings. Daylight robberies….. I am retired living on a minimum limited SS income with health issues. I am 76. This is a long shot. Will Dominica welcome me for a long time retiree. What’s the infrastructure…travel, internet, healthcare..
Genealogy: Your Ancestor Shot and Killed My Ancestor!